Property 8: Cosy Cottage " Eliza Stays" Getaway. Enjoy a round of golf while staying in our cozy country cabin. Property 18: Enjoy a round of golf while staying in our cozy country cabin. Property 22: Cute SARADISE COTTAGE......Saratoga, Central Coast N.S.W. Studio 44 B&B Balmain. A cottage in a garden. Property 24: Studio 44 B&B Balmain. A cottage in a garden. Central Albury location with tennis court. Family and Pet friendly. Property 46: Central Albury location with tennis court. Family and Pet friendly. CONYNGHAM COTTAGE - located at Gladstone SA. Southern Flinders Ranges. 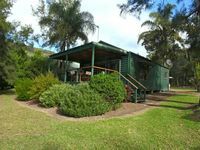 Property 50: CONYNGHAM COTTAGE - located at Gladstone SA. Southern Flinders Ranges. Cabin is perfect for a relaxing getaway. Had all the essentials we could possibly have asked for and more (extra tea, coffee, toiletries, spare blankets, popcorn etc) and in a great location. No issues with anything despite previous reviews mentioning problems with the shower. A perfect location for exploring the north of Tasmania. We loved our stay Arendon Cottage. Karen made us feel very welcome and the cottage was lovely and cosy. It was also very close to Launceston airport. I would happily recommend Arendon Cottage to other travellers.